— Reallocation of patent monopolies to a number of medicinal products driving sales, which caused a need for international companies to reduce operating costs. The transfer of single products or even product portfolios to local market players for promotion and marketing resulted in a number of BD deals. — Increased attention on the part of pharmaceutical companies to their commercial and financial practices driven by the AMCU’s ongoing investigation on the pharmaceutical market, its decisions, which are currently being appealed in court, as well as the position of the tax authorities. Companies are reviewing their models of cooperation with pharmacies and distributors, commercial policies and other internal documents affecting their standing on the market. — Diversification of product portfolios with related products, including dietary supplements, leads to the appearance of a number of new legal issues for pharmaceutical companies. — Participation in public procurements by companies, which have previously avoided participation in tenders, driven by reform of the public procurement sphere (procurement via specialized organizations, e-procurement). A lot of legal inquiries arose from specific regulation of procurements, as well as the attention of the state authorities to this area. — Increase in competition leads to more attention to the competitors’ activities. A number of projects related to companies’ claims against each other’s promotional and advertising materials. Some of these cases were successfully managed via mediation procedures. — Increase in attention to anticorruption compliance driven by specific regulations on public procurements, as well as the first FCPA case on the pharmaceutical market in Ukraine. — Withdrawal of some wholesalers from the market resulted in projects on debt collection and potential insolvency. — Ongoing reform in the sphere of medicinal products’ supply and medical sphere, including reimbursement, simplified registration of medicines and expected reform of financing of healthcare institutions in 2017 will have a significant effect on the pharmaceutical market, which will cause a review of existing practices and a need for legal support in such review. Arzinger’s sizeable life sciences and healthcare practice is among the largest on the market and has accumulated clients operating in pharmaceutics, clinical trials, medical services, medical devices, cosmetics, special food products and biotechnologies. The team has notable expertise in regulatory, competition, anti-corruption and compliance, intellectual property, labor and contract law. Among the sound strengths of the firm is its specific competition law advice. Thus, Arzinger’s team accompanied provision of information by a leading pharmaceuticals company at the request of the Antimonopoly Committee of Ukraine. As a part of a large-scale competition investigation in the pharmaceutical market, the firm rendered support to an international pharmaceutical company in proceedings on its alleged competition violation in the form of anti-competitive concerted actions with distributors. Additionally, the team extensively advised on public procurement and provided comprehensive legal support to a number of clients that participated in tenders carried out by specialized international agencies. Arzinger benefits established partnerships with legal advisers in foreign jurisdictions and is at the forefront of legislative initiatives. The dedicated partner Lana Sinichkina is praised for her in-depth industry expertise, regulatory, compliance and procurement matters. Managing partner Timur Bondaryev is acclaimed for his strategic vision of the market. Being a full-service international powerhouse, Baker McKenzie utilizes a broad range offering in its healthcare industry group. The firm has a strategic focus on complex transactional, tax, IP, antitrust, investigations and compliance matters. Among the team’s benefits is its unmatched track record in healthcare M&A and significant experience in pharmaceutical products’ portfolio transfer. The current highlight is advising Shire plc and Baxalta Incorporated on Ukrainian law aspects of their integration, following completion of global acquisitions; advising Baxter International Inc. on Ukrainian law aspects of the spin-off of its biopharmaceutical business. The practice group is in the mainstream of reform efforts in the sector and acts as the official legal adviser of the Association of Pharmaceutical Research and Development (APRaD). The office has managed to enhance client portfolio with the local majors, including Farmak, Borschagivsky Pharmaceutical Plant, and is a preferred counsel of choice by global multinationals (e. g., Abbott, AbbVie, AcinoPharma AG, Eli Lilly, Novo Nordisk, Novartis, Takeda and others). The practice group is headed by a highly active transactional practitioner, counsel Olha Demianiuk. The multidisciplinary team comprises dedicated well-known practitioners Oksana Simonova, Mariana Marchuk, Yuriy Zaluskyy and Yulia Kolchenko, advising on antitrust, employment, compliance, tax, IP, litigation and other matters. Legal Alliance Company is a niche law firm dedicated exclusively to the pharmaceutical sector, with exceptional experience in regulatory, as well as competition, commercial, compliance, tax, IP and dispute resolution. The past year was marked with the development of clinical trials support. The team completed a huge amount of projects in the sphere of advertising and promotion for famous pharmaceutical companies such as Boehringer Ingelheim, MSD, Novartis, Teva, Apotex, Jadran, Reckitt Benckiser, Berlin Chemie, Pfizer, Astellas, Takeda, Roche, etc. The whole partnership team, Oleksii Bezhevets, Andriy Gorbatenko, Dmytro Aleshko, is known for being well-versed to serve the needs of industry clients. Illya Kostin is known for extensive industry expertise and long-standing presence on the market, with special references of late for his IP advice. Marchenko Danevych has a market recognized sizeable life sciences practice advising leading corporations, business associations and governmental institutions. The team is hired for sector specific domestic legal matters advisory, encompassing regulatory, IP, competition, compliance, and features by its unique experience in the legal aspects of conducting clinical trials in Ukraine. The team advised the Ministry of Health of Ukraine on the development of the medicines registration system (initiated and financed by the EBRD) as the Ukrainian legal expert within the international consortium. Other highlights included advising a global innovative pharmaceutical giant, Eli Lilly, on regulatory and compliance, as well as contractual aspects of conducting clinical trials in Ukraine; acted as the outside counsel for Gilead on a precedential regulatory/IP case. The practice team has accumulated top clientele, among others, Novo Nordisk, Baxalta (now Shire), Johnson & Johnson, Ferring. Borys Danevych, eminent partner, is named a top policy expert and strong practical counsel. 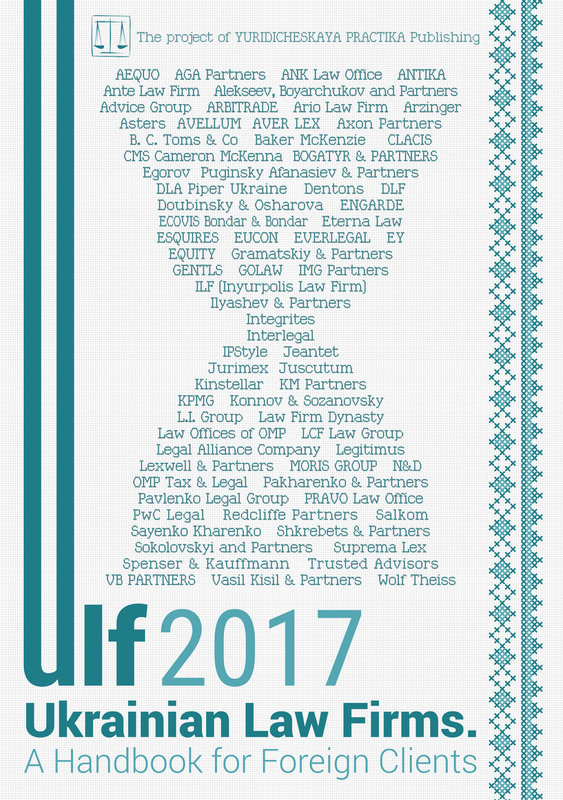 ILF (Inyurpolis Law Firm), a dynamic domestic firm with offices in Kharkiv and Kyiv, is active primarily in the area of healthcare. In the period of reform the firm develops its notable expertise in public private partnership (PPP) and judicial practice of disputes between patients and clinics. In 2016 the firms proliferates its unique PPP practice, currently working on landmark projects in this field. Another highlight is advising a foreign client on establishment of a diagnostics clinic on the foundation of a hospital in Kharkiv. The team assisted Hemo Medika Group, the leading Slovakian company producing medicinal diagnostics tools, in tenders of several hospitals in Kharkiv. Other projects of late included corporate disputes, reorganization and restructuring, taxation and sophisticated patient claims. Olena Khytrova, partner, is a lead partner of the healthcare and pharmacy practice. Managing partner Tetyana Gavrysh is an established figure contributing with reform initiatives. Law Offices of OMP enjoys a steady flow of clients and most recently is instructed for corporate restructuring, regulatory and tax, developing supply and distribution contractual base, structuring the relationship between pharmaceutical companies and drug stores. Among illustrative projects of the firm is complex legal support to Glenmark Pharmaceuticals on transformation of the representative office into a trading company and establishment of the unified tax and office maintenance hub issues management center for Novartis Group. The office continues fast development of its tax litigation in the framework of the pharma practice. The practice team is co-headed by two partners, Mykola Orlov and Igor Ogorodniychuk. The Kyiv office of international giant DLA Piper has a strong pharma focus and commands a mixture of international and major domestic players in its client portfolio. In addition to product life cycle and regulatory matters, the team regularly acts across IP, IT, finance, tax, antitrust, employment and other areas. The firm advised the Georgian Industrial Group on acquisition of a 29.29% stake in Ukrainian insulin producer JSC Indar from Polish biotechnological company Bioton S.A. Among recent assignments is also advising British company Crown Agents on legal matters relating to agreements with the Ministry of Health of Ukraine to procure medicines under special state-financed programs. Partner Galyna Zagorodniuk, who is referenced on the market, is active in M&A, corporate, competition investigations and compliance for pharma companies. Another notable practitioner for corporate and commercial matters is Alla Kozachenko, legal director. Natalia Pakhomovska, partner, has extensive experience of privacy and data protection, advertising and regulatory aspects of the conducting of clinical trials, while the traditionally strong tax team headed by Illya Sverdlov advises clients on VAT, tax controversies, transfer pricing and tax structuring. Sayenko Kharenko’s multidisciplinary group is noted for advising healthcare and pharmaceutical companies across a slew of issues related to developing, importing, manufacturing and marketing pharmaceuticals and medical products in Ukraine. Recent work highlights include representing PJSC Borshchagivskiy Chemical-Pharmaceutical Plant before the Ukrainian Ministry of Economic Development and Trade on the termination of special sanctions; advising one of the leading domestic pharmaceutical companies on protection of the company’s pharma brands from an evolving infringement. The firm is traditionally largely involved in competition law acting for industry clients, among others related to the EUR 22.8 billion acquisition of Sanofi’s animal health business by Boehringer Ingelheim; advised on Ukrainian competition law issues related to acquisition of the dermatology business of Astellas Pharma by Leo Pharma. Other significant clients include DENTSPLY International Inc., Novartis, Primester General Partnership, Reckitt Benckiser Household & Healthcare Ukraine, Sirona Dental Systems Solvay. Partner Oleksandr Padalka and counsel Anzhela Makhinova are the key contacts in this area. Dentons advises on a wide range of regulatory matters, including import, production and sale, tax, and has a special focus on corporate and sectoral M&A, IP protection, compliance, employment assignments. International clientele ensures the consistent workflow from global pharmaceutical and healthcare players, clinical trials organizations, wellness solution providers. Partners Volodymyr Monastyrskyy and Markian Silecky handle projects in this industry. Igor Svitlyk, associate, received strong market feedback for his deep expertise in clinical trials. Ilyashev & Partners is known mainly for acting on a great variety of disputes as led by its managing partner Milkhail Ilyashev. IP litigation is one of the firm’s key strengths. The active recent caseload includes representing Megainpharm GmbH in its court dispute with the Pharmaceutical Company Darnitsa regarding patent rights; acting for Omnipharm as for IP rights protection for a trademark that is well-known in Ukraine. In the past year the firm added to its portfolio export and import, regulatory, competition and distribution advice. For instance, the practice developed the delivery of medicines produced by Ukrainian company Biopharma to Yemen. Other active clients are Feron, VILAN, Takeda, Pharmacy of Hormonal Drugs, Business Centre Pharmacy, ERGO International, Valenta Pharm. Irina Kirichenko, IP lawyer with a vivid pharma focus, is recognized. Stanislav Koptilin is another key figure. AEQUO has managed to win consistent praise from prestigious international brands and leading domestic producers. The practice covers regulatory and compliance, corporate and competition matters, and is particularly known for performance on patent disputes. In the list of noteworthy cases of the firm is defending Dr. Reddy’s biosimilar product in the Superior Commercial Court involving a biosimilar medicinal product registered in Ukraine. The team of renowned IP and dispute resolution partner Oleksandr Mamunya handled representation of the client in a utility model cancellation action related to an anticancer drug and representing a US-based clinical stage biotechnology company in a number of patent prosecution matters. Anna Babych, corporate and M&A partner, leads subsequent queries of industry clients. The competition practice of the firm, in particular Sergey Denisenko, counsel, rendered strategic advice in a case on unfair competition issues related to advertisement of medicines. Zeneca’s portfolio of anesthetic medicines. Svitlana Chepurna is another key partner for the pharmaceutical and healthcare practice. Vasil Kisil & Partners follows a multidisciplinary approach, rendering service in the pharmaceutical sector in finance, M&A, competition, product liability and litigation matters. The firm rendered legal assistance to CEN Biotech Inc. with the intra-group restructuring of Ukrainian subsidiaries. The firm regularly advises clients on developing, manufacturing and marketing medical products, and related regulatory and intellectual property issues, sector specific competition and taxation matters. Pharma clients prefer as a counsel the firm’s employment team. Counsels Volodymyr Igonin and Anna Sisetska are the main figures. The top transactional Ukrainian counsel AVELLUM is a port of choice in terms of global M&A in the sector, covering corporate, employment, tax, regulatory and compliance matters. For example, the firm participated in one of the largest M&A deals on the world pharmaceutical market when it advised Allergan Inc. in connection with the global sale of part of Allergan’s business to Teva. Another transactional highlight is being a lead counsel to Farmak in the course of its acquisition of a Polish line of business. Managing partner Mykola Stetsenko is the top M&A figure. Dmytro Marchukov, dispute resolution partner, brought a wealth of litigation assignments to the firm’s caseload. EY has extensive experience in providing services to the pharmaceutical industry. The legal team is known primarily for complex legal and tax advice on restructuring of operations in Ukraine to multinational pharmaceutical companies, regulatory requirements and taxation, and also for its advice to foreign pharmaceutical companies operating in Ukraine through representative offices regarding the potential risks associated with it. The core team includes Iryna Kalyta and Iryna Kovalenko, under the guidance of two partners: Vladimir Kotenko and Albert Sych. EQUITY (called FCLEX up till June 2017), Ukrainian legal counsel with a proliferating litigation focus, is dedicated to IP, corporate and tax instructions from its established domestic pharmaceutical clientele (Arterium Corporation, Kyivmedpraparat, NPO Farmatron, Halychpharm). The firm continues to render tax advisory for Arterium and acts for NPO Farmatron in three IP disputes with the Darnitsa Pharmaceutical Company. Oleg Malinevskiy, litigation partner, guides the practice. GOLAW advised pharma companies on IP, finance matters, dispute resolution, corporate, commercial and employment in connection with activities in Ukraine. The firm advised Mercator Medical LLC on the implementation of an uninterrupted supply of medical products in Ukraine. The team is known for its consistent support to the Bogomolets National Medical University in a range of cases. Managing partner Valentyn Gvozdiy is assisted by Iryna Kalnytska and Maksym Lebedev. Eterna Law is made up of lawyers from corporate, tax and IP practices to fulfill pharmaceuticaland healthcare clients’ requests. The firm’s recent caseload includes tax structuring, debt restructuring, corporate matters and M&A. The work is overseen by corporate and M&A partner Oleh Malskyy. Ante Law Firm is catching up assignments of industry clients along with its core practice areas of work. It advised Technomedex group on distribution of unique medical devices to Ukraine that involved IP rights issue, medical devices regulations, taxation and distribution issues. The client list takes in Omega Pharma, Sandoz, and Ukrainian pharma marketing company Zdravo. Managing partner Andriy Guck is the main figure. Aleksey Pukha and Partners commands a following of Asian clients and gained notable experience of contentious work. The firm represented Medrex Trading Singapore Co. (Singapore) in a collection of debts by contract of supply of medical goods, and acted for Apic Pharma on conclusion of an agreement on supply of medicines with the distributor Falbi, and acted on a debt collection procedure. Aleksey Pukha is the lead partner. De-Jure, the Odesa-based law firm, guided by Andrii Pavlyshyn, supported one of the biggest private clinics in Ukraine in the course of acquisition of a medical license.